What’s that old advertising line? “I can’t believe I ate the whoooooole thing”? That’s us after the feasting holiday. We had a nice group of family over – there were ten of us at the table. My brother C brought along his new poppy – a German Shepherd about 10 weeks old, who is adorable. She played hard before and after the meal, and slept quietly in the car while we ate ALL THAT FOOD. Here’s the table from above – before people and food, but of course, with my supervisor, Zumba. She hid from the puppy all day, but was pleased when people looked for her and patted her. She does love people! So, today, we are low-key – tidying up, emptying the dishwasher and running it again. Taking the leaves out of the table and putting it back where it belongs. And I have to make some cookies and artichoke dip for the parties that will be happening Saturday and Sunday. Lots of family to see and places to go. There will be lots of shoveling, too, since we did get a ton of snow Wednesday night. But the good news – although the satellite TV and internet went out for a while, we did NOT lose power. (We did lose it last Monday when it was just windy and rainy, so we can’t explain this but aren’t complaining!) A shoveled the walk way, and the plow guy came, so we were able to have people get in and out safely, but we do have to dig out our cars, the propane tank, etc. That’s it, I think. Laundry, knitting, maybe a trip to the post office. Most of the big chores are done, as A was home all week, and kept up with things. So, a nice quiet day at home, just digesting…thankfully. Thought I would give you a look at some things I have gotten done lately. The black mitts – delivered last night and love for them was professed. They are too big for me, but will fit the recipient just fine, I think. The 25th pair of socks this year! You can read more about how I did them on my Ravelry project pages here for socks and here for mitts. However, I think it basically went well. If I am going to keep on doing this, I need a better display, especially for the jewelry. I need to figure out a way to highlight that my things are made with really great fibers, many locally sourced. Also, the specialty touches like local stone buttons, local fiber. I need lights, preferably true color ones. The lights in here were very yellow, and made all my reds look rusty, and my blues lacked life. 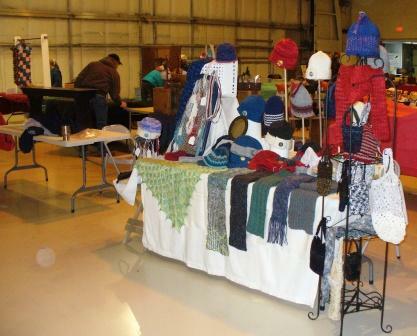 People shopping at craft fairs want bargains. Have a bargain basket. 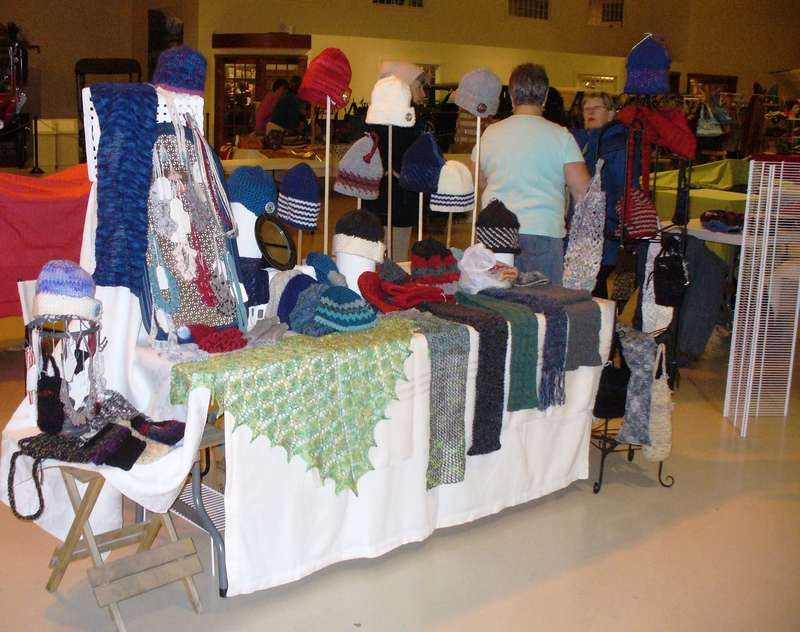 People shopping at craft fairs are often buying gifts and it doesn’t matter if they love the hat and look adorable in it, if it is for a gift, they will hem and haw and often walk way. Don’t make what I don’t like. The hats that sold were primarily the ones that I thought “Well, if this one doesn’t sell, I will be OK with that, because I really like it and will wear it” the ones I knit to have more universal appeal are sitting in a bag in the car right now. Those (danged) ruffled scarves sell like hot cakes. Sadly, the lady at the booth next to me had HUNDREDS of them for $5 a piece, and all day I listened to her extolling the virtues of them and how the price is a steal, doesn’t even cover the price of the yarn. Well, good for her (she sold nearly all of them) and bad for me sitting beside her with $40 beautifully cabled wool/silk scarves which will actually keep you warm. But not good present material, apparently! My products have a demographic. It might not be people who shop at craft fairs. So, how did it go? For the most part, great. I sold 4 hats, which is not a lot, but covered my fee and some yarn, and I have lots of inventory/Christmas presents now. The jewelry did not sell at all, although the people who did notice it really seemed to like it, they didn’t ask me the price so much as how hard was it to make them, how did I do it, etc. That was a bummer. I won’t make more until I figure out how to sell these. Even though I love them, I guess grandmas weren’t sure that kids would like them, and the young women going through didn’t stop and find them in my booth. See what I learned number 1. I had fun, my sister and I were glad the other was there (it meant we got bathroom breaks, etc) and we had a nice visit together. The show was not mobbed, but had steady traffic. C had a good day selling her pottery, she taught me the bargain trick, which I will use in the future – she had a “Bargain shelf” and sold nearly everything she put on it. She just kept moving things down to it. Sometimes she would lower the price and sometimes not. I think she picked up a few customers who understand artful pottery, and is building a following here (it is her second year). C putting her booth together morning of – she is good! Set the whole thing up in less than an hour. I wish you could really see her beautiful bowls. They are elegantly shaped, and her glazes are just beautiful. Then the woman who spent a long time with my hats, slowly moved over to my sister’s booth, and almost immediately came rushing back. She has a daughter who is married to a hockey coach, and so sits for hours in ice arenas. Turns out my sister had a big warm muff and scarf that matched one of my hats. She bought the lot. Then there was a couple looking for presents. They tried on all the hats. While they eventually left without buying anything (waiting for a text on colors and sizes) they made my booth fun and vibrant while they were there, and they were very appreciative of the quality of the work, and the uniqueness of the products. Lastly? The shy Asian woman who looked, left, came back later and shyly tried on two hats, back and forth for the last ten minutes of the show before choosing a hat. She looked so happy with the one she chose. It was a good day, and though I am exhausted, I will do it again. And I will be thinking about other ways to sell my work. It is fun to see people in my hats! Different kind of a list today, because tomorrow I will have a booth at my very first craft fair. I am nervous about it. Nervous I don’t have enough inventory, nervous I don’t have enough variety, nervous I have the wrong sizes/colors, nervous that my prices are too high, nervous I will sell out early, nervous I will not sell anything. I need to ignore all that and just get ready and do my best, right? This is how I learn what sells. Today I need to make sure I go over my list and pack everything I will need, then load the car with it all and head out. I’ll be staying overnight at Mom’s, as she is right near the venue (the Owls Head Transportation Museum in Owls Head, from 9-2 on Saturday, please come if you are in Maine!) and is happy to have me. Today I will set up the table and get my head ready for it, then help Mom make a million sandwiches for the food stall. There will be some visiting before bed. Little Niece E will do some entertaining, without a doubt. In the middle of all that, I will do plenty of nervous knitting and probably some last minute display prep. Lots of deep breathing is also on the list. I know, no Friday list. Again. Yep, that’s right, I quit my job. I tried hard not to. I tried to work through the burnout (that doesn’t work, right?) I tried to negotiate a long leave, but that really doesn’t work for the agency with my position. So, I quit. Sort of. Jan 2 is my last day as full-time in my current position. Jan 5 I start as a part-time employee, just doing the tax program. When April 15 comes, I think am “done” as they say around here. Then I will take some time to just rest, relax, refresh, recover. I hope at the end of that time, I know what is next. I had hoped that what was next was my job, but I know it might not be available when I am ready for it. It feels fabulous. That means it is the right thing, right? So. Friday – it was a good day. I picked Mom up early and we went to Portland to knit and lunch with sister C and little niece E, who had a half day of school. She is 8 now, and very excited to show me her new “round (circular) needle she got for her birthday, and the hat she is making. She was fascinated by my row counter, and luckily, I did not need to know what row I was on. I think I know a Christmas present… C and I talked about the craft fair that is this coming Saturday (in Owls Head, if you are around and want more info, let me know!) She will be selling pottery and hats, and these GREAT muffs she invented. I will be selling hats and jewelry and whatever else I finish up this week. NOT socks, can you believe it? Mom will be working the food booth, so it will be a family event, but we won’t really see each other, except that C and I will be in side by side booths, I hope. Today is catch up on chores and things around town, and laundry at home. Sounds fun, right? I need to go get going on that stuff… I’ll catch up with you all later and show you what I have been knitting. Saturday we went to Bangor so that A could help L with her laundry and shopping – likely the last time we have to do that, because she really can manage on her own now, with some forethought. A backpack works for carrying the laundry up the stairs, and groceries can be carried into the house a little at a time. She is making amazing progress! While in town, I ran over to the Maine Harvest Festival – like a GIANT farmers market, held once a year.. I was headed in for my annual supply of cranberries – they were 5 pounds for $10 – great price for locally grown big fat lovely berries. 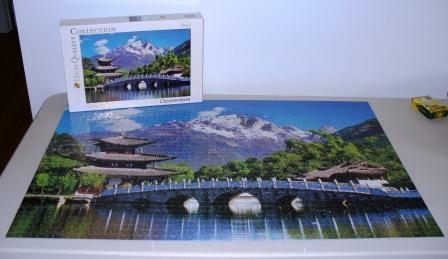 Then I spent the last hours of daylight to finally finish this monster puzzle that we started when L came to stay – she never really did any of it, but once we got to a certain point, I could not put it away until it was done – 2000 pieces! Many which seemed to fit where they should not, it was a challenge, to say the least. Here’s a quick knitting update – finished the Tern socks, They are cozy and warm, and I love the soft blues and grays. I adapted that pattern to make some finger-less mitts a friend requested – they are coming along. I couldn’t work on these when the power was out – the black is too hard to see in the candlelight. But now that we have power, I am back to working steadily on these, too. Simple rectangles that are mirror images of themselves, and when done, just need a side seam sewn up, leaving a gap for the thumb. 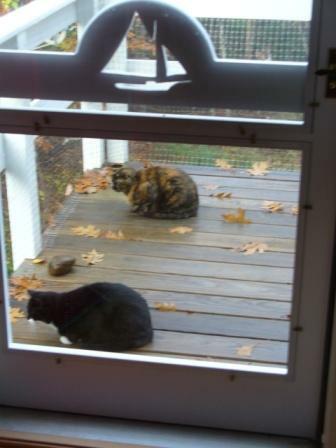 Allie and Zumba insisted on going out on the deck today – can you guess where the bird feeder is? They love watching it from the deck but can’t seem to figure out that they could sit on the window seat in the bedroom and be warm while they watch the same birds. They are cute, but maybe not so bright. A has tomorrow off, I have Tuesday – not sure what I will do with a whole extra free day this week! Sorry not to post my list today as usual – life is complicated this week! Power came back on – beeping and clicking and flashing lights woke us from a deep sleep in the middle of the night Tuesday – you know – a little before 8. 🙂 Once we were sure it was really staying on I leaped up, turned on the dishwasher and pellet stoves, flushed the toilets, washed my hands, plugged in the DVR to record NCIS, and went back to bed. Since then, we have played catch-up. It has been warm, so the snow has almost melted, and all the dishes are done, laundry is back under control – amazing how 3 days with no power can create havoc! Today I went and got the snow tires on the other car, and met Crimson Crow in town for a fun morning of errands and chatting (you knew you would be here, right, CC?) and a good breakfast at the Riverside restaurant. After I left her, I stopped in the office to drop off my time card, then came home to clean out the fridge. Very exciting. Got to throw is all away, then scrub shelves, etc. Haven’t opened the freezer yet, but all of that will be tossed as well, and that will get cleaned this weekend. I’ll post later this weekend about the other fun things we have planned, but for now, know that we are safe, have lights and water again, and knitting is happening again. Author salpal1Posted on November 7, 2014 Categories how I spent my dayTags alpaca yarn, dip, errands, game night, knit, power outage, to-do list3 Comments on I’m ba-a-ack!